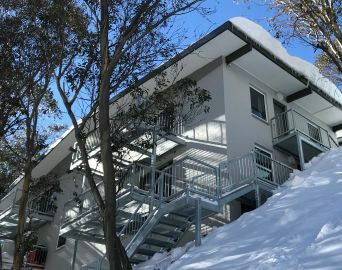 Langrenn is a fully self contained two bedroom flat located in the IMAJ development on Falls Creek Road, 100m from the main ski bowl, and close to chair lifts, restaurants and ski hire. The unit is a short walk from the Village Bowl and the Eagle Chair Lift. The Aquaduct passes close by and provides xcountry skiing access to the Nordic Bowl and beyond. The Foodworks Supermarket and Post Office are located in the ST Falls complex adjacent to Slalom Plaza. 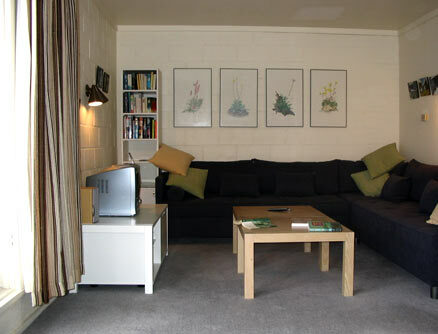 The unit consists of an entry/ski room, lounge dining area, kitchen, two bedrooms (one with an ensuite toilet and shower) and a separate bathroom and toilet. Members also have use of a storage area in the basement, accessed from a lower door. The bedrooms have four comfortable bunks with 900mm wide mattresses. Blankets and pillows are provided and each bed has an electric blanket. You must provide your own sheets, pillowcase, towel and bathmat. A telephone is installed which takes incoming calls. The phone is STD barred, but reverse charge calls can be made.There are public phones at the Frying Pan, The Hub and the hotel. A balcony is accessed from the dining area, overlooking the Fails Creek Bowl. In winter it is a good place to keep bottles of drink in the snow to save space in the fridge. The kitchen has a stove, a microwave, a sink with normal hot water, a dishwasher and a large refrigerator. It is equipped with almost every cooking utensil known to man/woman and has a toaster, electric frypan and hand held mixer. There are full sets of crockery, cutlery, glasses, saucepans, basins etc. Condiments, spices, tea, coffee, sugar. Cleaning equipment and toilet paper. Linen, towels, tea-towels, personal soap and toiletries. Food and drink, personal entertainments. A self help system by all guests keeps the place clean and livable. The change over time is 3pm on the day of arrival. Those departing must clear the bedrooms by 3pm and depart the flat by 4pm. Please completely clean the flat before departure so that the people coming in can enjoy the start of their holiday.